Rotha June Alofs Essenburg, age 85, of Cutlerville, joyfully entered the Heavenly Kingdom of God early on Friday, January 25, 2019. Rotha was born on June 17, 1933 in Holland, MI to Warner Alofs and Johanna Douma. She was a member of Graafschap Christian Reform-ed Church. She married Ted Essenburg on September 14, 1951. They had four children, Vonda Essenburg (the late Michael Gieszer) of Byron Center, Sheryl Essenburg (Dave Ross) of Springfield, IL, and Craig and Keith, both of whom preceded her in death. Early in her marriage she made time to sell Avon to her Ellsworth neighbors. After moving to Cutlerville in 1955, she worked in numerous settings including her church, Cutlerville East CRC, the Photo Reporter, and Pine Rest Christian Mental Health Services. Her main roles were those of wife and mother. She took those very seriously and creatively made a loving home for her family; that included cooking (which she did not like), baking (she liked that), sewing her girls' clothes (and their doll clothes), decorating on a pretty tight budget and those several hundred other things it took to keep her brood happy and in good shape. 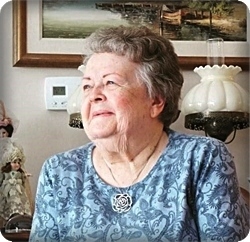 In addition to employment, Rotha was involved with many church and community activities; she crocheted baby afghans, helped make lap blankets, and sorted donations for the Christian schools' thrift shop. Rotha was a very busy woman, but in her spare (!) time, one of her favorite things was to write poetry. She wrote many poems about Jesus; His love, His salvation, His many gifts and blessings. She wrote poems for birthdays, anniversaries, babies' births, beloved friends, and special occasions. She had dozens of poems published in the Banner and other publications. We believe that Rotha will be fondly remembered for the thousands of caring cards she sent to people she knew and some she did not. She sent cards for all occasions and made many of the cards herself. Rotha was preceded in death by her husband, Ted Essenburg (2016); her sons, Craig (1975) and Keith (2011); her brother, Lloyd Alofs (Jan); and her brothers-in-law, Bill Essenburg and Jim Essenburg (AnnaMae). She will be deeply missed by her daughters, Vonda and Sheryl; her grandchildren, Sarah Ross; Elizabeth Ross, Craig Ross; brothers, Wayne (Virginia) Alofs, and Jason (Shirley) Alofs; in-laws, Lorrie (Doug) Way and Deb Essenburg; and many nieces, nephews, and cousins. Two women, Cathy Miller, her daughter-in-law, and Kim (Alofs) Roen, her niece, were very dear to Rotha; she loved them as her own children, and they loved her as much. The family will greet relatives and friends on Monday, January 28, from 4 - 7 pm at Stroo Funeral Home. The funeral service will be held at 11 am on Tuesday, January 29 at Cutlerville East CRC, 501 68th St. SE, with Rev. Ronald DeYoung and Rev. Sarah Ross officiating. There will be an hour of visitation prior to the service. Interment will be in Blain Cemetery. In lieu of flowers, memorial contributions may be made to Legacy Christian School or the Pine Rest Patient Assistance Fund. Sorry we weren't able to come, but thoughts and prayers are with your family. May you experience God's comfort and presence.